As the conflict in Wisconsin shifts from a battle over budget deficits into an ideological debate, some high-profile Republicans -- potential presidential contenders -- are lining up behind Republican Gov. Scott Walker. Public workers and their supporters argue that eliminating most public unions' collective bargaining rights has nothing to do with the budget and that the governor should drop that element of his plan. Walker isn't budging, however, and several other politicians in the GOP have his back. Former Minnesota governor and possible presidential candidate Tim Pawlenty released a video today that uses dramatic music and quick cuts of protest footage to show support for Walker. At the end of the minute-long video, Pawlenty is shown on a news program saying, "It's really important that America stand with Walker, stand with Wisconsin." Pawlenty also launched a petition on his political action committee website to gather public support for Walker. "Governor Scott Walker is making tough choices needed to avoid financial ruin," the website reads. "The nation's governors don't need a lecture from a President who has never balanced a budget. All levels of government need to bring public employee compensation in line with the private sector... I'm confident Governor Walker's reforms will succeed in Wisconsin. Stand strong, Scott -- average taxpayers everywhere are rooting for you." Wisconsin Democrats in hiding: Inside the "Hotel Outside Wisconsin"
Pawlenty's website fails to mention the unions' willingness to compromise, or the fact that Wisconsin's budget problems could be solved with other, non-controversial measures. Former House Speaker Newt Gingrich, another potential GOP presidential nominee, just published a public appeal on the conservative website Human Events for support for Walker. "It is vital that every one of us help Governor Scott Walker today," Gingrich writes. He urges readers to call their elected representatives and ask them to back the Wisconsin governor. "In Madison, Wisconsin, we are witnessing a profound struggle between the right of the people to govern themselves and the power of entrenched, selfish interests to stop reforms and defy the will of the people," Gingrich writes. "However, through a campaign of intimidation and cowardice, the government employee union bosses and the Democratic Party that is beholden to them, are trying to thwart the will of the people." He calls the conflict "one of the most important struggles in modern America," as well as a "life and death struggle with the forces of the old order." Gingrich also notes that he was an early supporter of Walker's and blasts President Obama for supporting the unions. In an interview on CBSNews.com's "Washington Unplugged" yesterday, former Arkansas Gov. Mike Huckabee said he would advise Walker to "stand tall, stay firm." "He's doing what he's doing because he's clearly grasped that as a governor he's going to be responsible for balancing his budget," he said. "I think it's a responsible action on his part." Former Massachusetts Gov. Mitt Romney, meanwhile, is giving $5,000 to the Wisconsin Republican Party through his political action committee, Politico reports. "Liberal big government interests are fighting efforts to rein in out-of-control public employee pay and benefits in Wisconsin," Romney said in a statement today. "It is critical that we stand with the Wisconsin GOP as it stands up for the rights of the taxpayer." Yesterday, the Hotsheet reported on the support Walker has received from conservative groups like the Tea Party and the Koch-backed Americans for Prosperity. The debate in Wisconsin has become a proxy for the larger national debate taking place over government spending and deficits. Walker said this week he communicates regularly with Republican Govs. John Kasich of Ohio and Brian Sandoval of Nevada, suggesting he isn't the only governor willing to take on public unions. "There's a lot of us new governors that got elected to do something big," Walker said this week. "This is our moment." Similar protests over anti-union bills have erupted in Ohio, Indiana and elsewhere, but not all Republican governors are following Walker's lead. Yesterday, Indiana Republicans dropped their controversial bill after Republican Gov. Mitch Daniels said it wasn't worth pursuing at this point. Liberals are also taking the debate to the national stage. 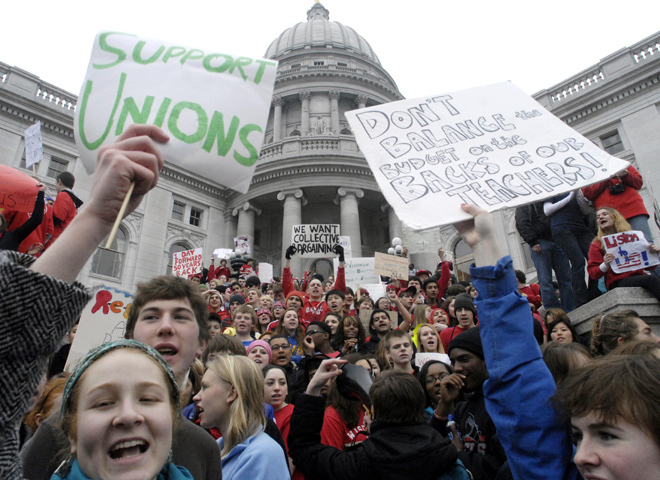 As fervent protests continue in Wisconsin, the Service Employees International Union and MoveOn.org are organizing rallies in all 50 states on Saturday to show solidarity with Wisconsin's public workers.